The handcar was completed in October 1989, just in time for the Depot Day event that year. The car was tested briefly on the museum tracks on Oct. 11. The handcar project was the handiwork of Gene Allen, Jim Higman, Bob Mahan, and Ralph Moore. 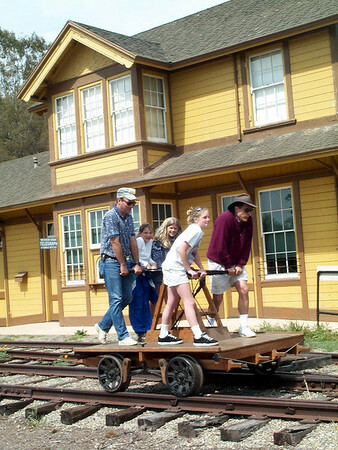 Free handcar rides are offered monthly at the museum. The handcar ride is also available on request for a small fee. There is a 48-inch minimum-height requirement to ride. Volunteer Bill Parker shares a ride with a visiting family.